Having forgotten what he’s meant to say. And it’s the middle of a Shakespeare play. Actors have a nonsensical trick to cover this. And choose the trammelled way. And they tumble over each other in nervous succession. The actor who’s dried cries out in grim desperation. But always making sure to finish with ‘Milford Haven’. Until a kindly cast member can come to their rescue. 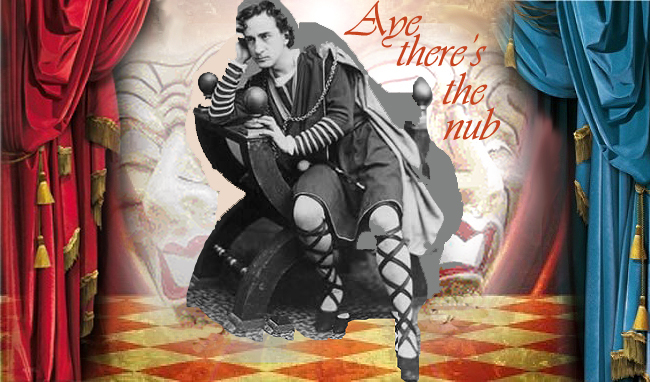 But the forged Shakespeare ‘nub’ enters green room history. With acknowledgments to Michael Coveney, chronicler of the nub in ‘Aye, there’s the nub: Amnesia – Michael Coveney on the persistence of a noble theatrical tradition’; London: New Statesman, 28 March 2005, and to Donald Wolfit and to Ken Campbell (authors of the two nubs quoted here) and to Alan Cox of The School of Night (and a quondam nubber). This entry was posted on 28 March, 2013 in homepage and tagged Alan Cox, Donald Wolfit, Hamlet, Heathcote Williams, Ken Campbell, Michael Coveney, Milford Haven, Nubbing, Shakespeare, Theatre, Thespian ploys. Bookmark the permalink.